This unique duo focuses on very rhythm-driven and accessible vocal jazz from the Great American Songbook and Brazilian jazz genre, interlaced with virtuosic guitar interplay. Maggie is the bassist and vocalist, singing in English, Portuguese and Spanish. When she’s not on stage with one of several local bands, she's a nationally acclaimed painter and a professor at Savannah College of Art and Design. 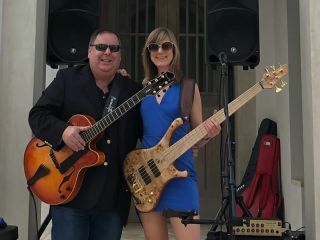 Howard is an internationally acclaimed guitarist, recording artist and lecturer, and President/CEO of Benedetto Guitars, the world’s premier maker of jazz guitars. He’s president of Savannah Jazz association and an inductee in the Coastal Jazz Hall of Fame.